Pendant, the word finds its origin in Old French and Latin language, has evolved from the Stone age objects of teeth, stones and shells to the modern day forms consisting of precious stones and delicate artwork. Civilizations have worn this piece of jewelry as a symbol of their culture and history often depicting scenes from warfare, aristocracy, religion and art. Some were shaped into mythical animal forms, and others into flowers and peacocks. Pendants have always stood for something significant. A one center of focus, symbolic and strong. 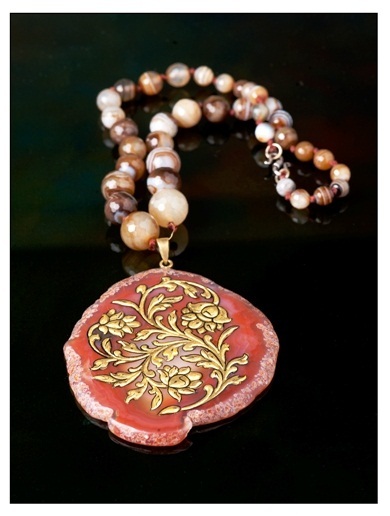 The Mystic Pendant still draws love and attention of art and jewelry lovers. Urja Utsav brings to you a beautiful handcrafted stone pendant embossed with a 24 carat gold layer formed into a delicate floral design. This little beauty has captured the fancy of many and looks timeless and precious in spite of ever changing trends. For orders & inquiries about size and price, please call us at +91-9413335533, email at urjautsav@gmail.com or simply drop us a message.